Maureen’s specialty is traveling, so she loves to introduce people to new places and let them know of any tips or tricks to keep in mind when visiting. What better place to learn about what to do in a certain place than from someone who is considered a travel expert? Miss Everywhere also loves to interact with the local wildlife. The wild animals inhabiting the places she visits are just as much a part of the local culture as the food or the music. 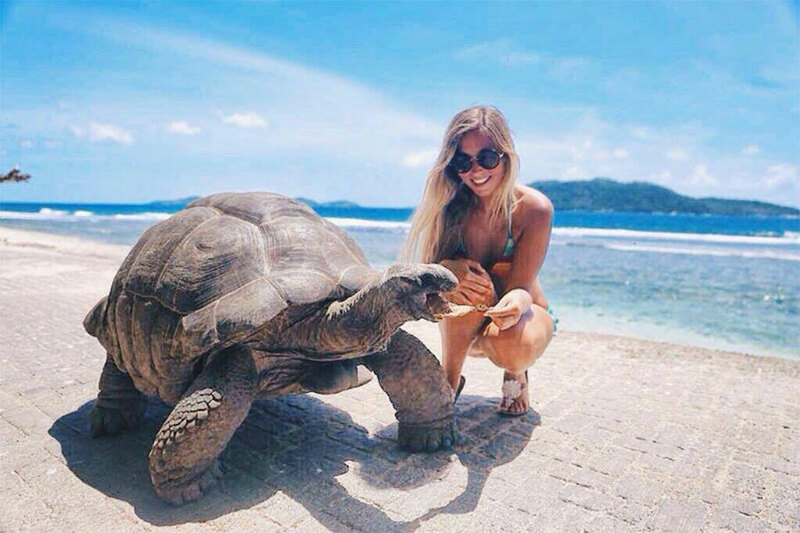 Here she is feeding a local tortoise in Seychelles. Sometimes she gets a little too close to the animals as you’ll see in #3. A recent trip brought Maureen to the Big Major Cay in Exuma, The Bahamas. 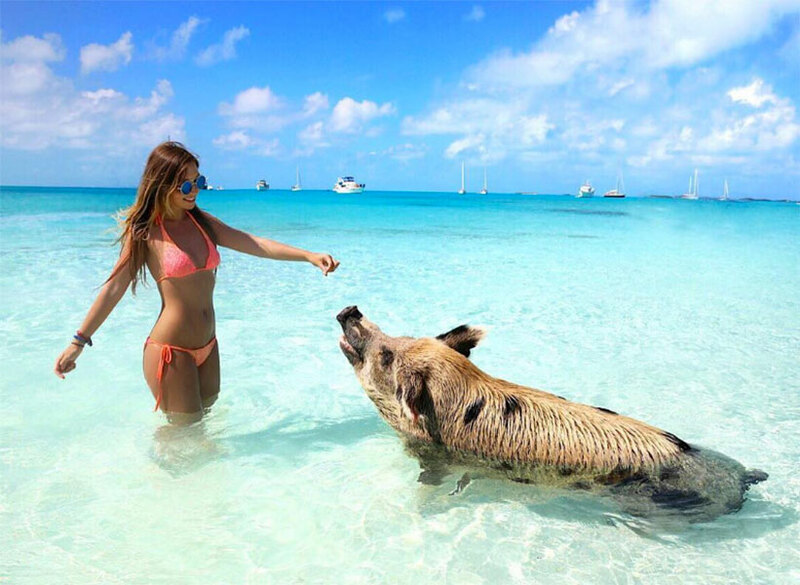 This specific photo was taken at a place called Pig Beach, a popular place where the people and the pigs can swim together in harmony. Feeding the pigs is an extremely popular attraction. We’re sure the pigs will agree. While on her trip in Exuma, Bahamas she discovered an excursion that allowed her to get up close and personal with the local shark population. She was having a blast until one of the sharks got a little hungry and thought her hand was part of their food. Find out what happened in #1. Don’t worry, Maureen is perfectly fine and still has both of her hands to carry her luggage to more exotic places. Thankfully, the shark wasn’t too hungry and really only wanted the food that was in her hand. It was a close call, but that won’t stop her from continuing to share her adventures on her blog and Instagram pages.